In his first speech to Progressive Conservative party members as premier, Dave Hancock apologized to them for the mistakes of the Alison Redford era. Without mentioning Redford by name, Hancock told about 1,300 party members Thursday that he was sorry the governing caucus lost touch with the grassroots. 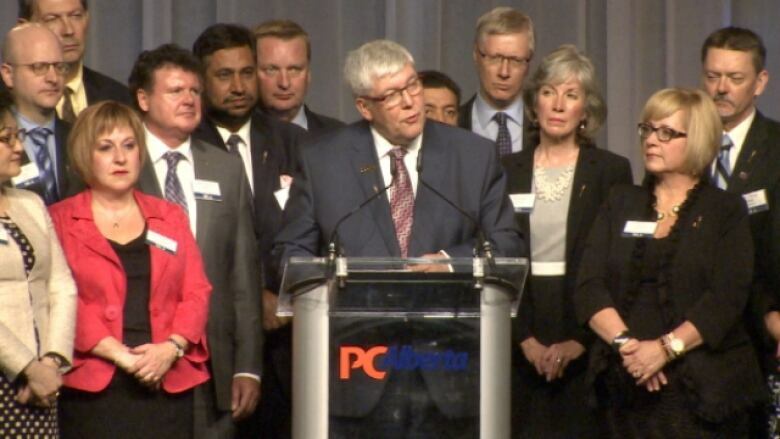 "We took Albertans and your support for granted and acted in a way that's contrary to our values," Hancock said at the party's annual Edmonton fundraising dinner. "I'm truly sorry that we allowed government to become a distraction from the vital work we're doing on issues that matter to Alberta. "I'm sorry we damaged Albertans' confidence in our party. "I apologize for losing touch with our grassroots, for not listening to you the way we should have. This behaviour is just not acceptable." Redford, who remains an MLA for the Calgary-Elbow riding, was not at the dinner. She has not been seen in the legislature since she resigned more than a month ago ahead of a caucus revolt over lavish spending and allegations of imperious behaviour. Surrounded by more than a dozen of his colleagues, Hancock acknowledged his party's reputation is going through a period of turmoil. Hancock said while the actions of caucus went off the rails, the core of its character is strong. "There is a big difference between behaviour and character," he said. "Behaviour can be changed. Character is a different matter. "We did get some things wrong, but we will demonstrate how we're changing through our policies, practices and legislation." "I've asked each and everyone one of my colleagues to be here on the stage with me," he added, "because this is the leader's dinner, and each and every one of these people is a leader in our communities and in Alberta." In a private question period after the speech, Hancock said it was not his intention to exclude the former premier from the evening event. "Alison Redford played a significant role for this province and participated in a very meaningful way," he said. The race to pick a new leader is already underway, with a leader to be selected on Sept. 6, and if necessary, Sept. 20. Calgary MLA Ken Hughes resigned as municipal affairs minister last month and has already announced he will run. Prentice is scheduled to introduce Hancock on May 8 at the next leader's dinner in Calgary. Other prospective leadership candidates include cabinet ministers Doug Horner, Ric McIver, Jonathan Denis, Thomas Lukaszuk and Diana McQueen. The new leader will have work to do. The PCs, Alberta's governing party for more than four decades, are mired at the back end of recent polls, alongside the Liberals and the NDP. The opposition Wildrose party leads by a wide margin. Without mentioning the Wildrose by name, Hancock said the fiscally hawkish right-of centre party is blinkered by its own ideology. "We're facing an opposition that believes everything has a fixed price. An opposition that knows the price of everything and the value of nothing," he said. 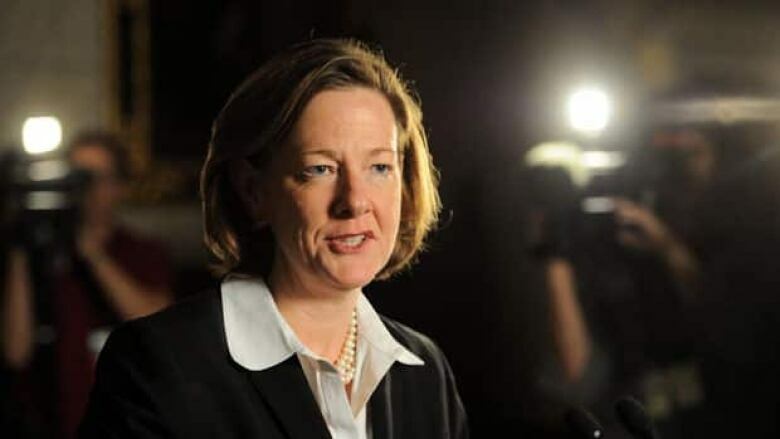 Alison Redford has not appeared at the legislature since she stepped down as premier in March. Hancock spent the balance of the speech lauding the PC government's accomplishments dating back to the 1970s era of former premier Peter Lougheed. Redford has not spoken publicly since her resignation. She has not been in the legislature for question period but has Tweeted pictures of herself meeting with constituents in her riding. Last week, photos surfaced on social media of her dining out and cycling in Palm Springs, Calif.
She was forced out over reports of exorbitant spending, including using the government airplane for personal trips for herself, her daughter, and her daughter's friends. Calgary MLA Len Webber quit the PC caucus shortly before Redford's resignation, saying she was abusive to subordinates. Since her departure, the province released documents under freedom of information rules showing Redford had planned to use taxpayer dollars to build a penthouse suite for herself and her daughter on top of the government's Federal Building.